At panoramicsystem.com, we respect our customers and understand that you are concerned about privacy. The purpose of this privacy notice is to let you know what kind of information we collect, how we use it, with whom it may be shared, what choices you have regarding our use of your information, and how you may review and change some of the data you provide to us. For your benefit, we’ve provided an Overview of our privacy practices and the Full Privacy Notice below. When you provide it to us: we collect personally-identifiable information, including name, title, company, address, email address, phone numbers, etc. when you voluntarily provide it to us. When visiting this site and are asked for personal information, you are sharing that information with Optima Graphics, our subsidiaries and related companies, and our service providers. We collect personally-identifiable information when you provide it to us. In addition, our website servers collect the domain names of visitors to our websites. In addition, we might receive personal data and other online and offline information from our business partners who share it with us. We will use such information in accordance with applicable laws and this Privacy Notice. We also use the information we collect to help target valuable marketing and advertising offers. This kind of advertising may be done with banner ads as well as promotional emails, and offers may be provided by our company as well as from our subsidiaries, affiliates, marketing partners, advertisers and other third parties. When you are on our website and are asked for personal information, you are sharing that information with Optima Graphics, our subsidiaries and related companies, and our service providers. We share your information as described in “Reasons we share information”, above. 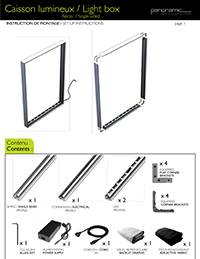 Check out our downloadable Panoramic™ catalog. It is a good overview of the Panoramic™ full visual system and a convenient reference when the website is not. It comes in two styles, both as PDF downloads. The "Desktop Version" is handy to keep on your computer and for quick prints. The "Press Ready Version" is ready to send off to your local print shop. 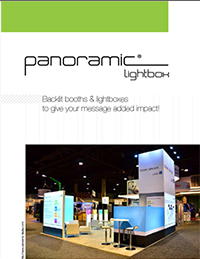 Check out our downloadable Panoramic™ Lightbox brochure. A great starting point for the Panoramic™ full visual system and easy to share with your customers who are new to the product. Download a PDF template. The vector template is easily opened in Illustrator and readily scalable for ease of use.